Astrocytomas are tumors that arise from a type of glial (supporting) cell in the nervous system. One of the more common pediatric brain tumors is the cerebellar astrocytoma, an astrocytoma that occurs in the cerebellum, a region in the lower-back portion of the brain that controls movement and balance. Cerebellar astrocytomas comprise approximately 15 to 25 percent of all brain tumors in children. These tumors also may occur in adults, but they are much less common. Most cerebellar astrocytomas are low-grade (slow-growing) tumors, and the prognosis for children diagnosed with this type of tumor is excellent. High-grade (or malignant) astrocytomas also may occur in the cerebellum, but they are very rare. The most common symptoms associated with cerebellar astrocytomas are, problems with walking, clumsiness, nausea, headache, and vomiting. Some initial symptoms of brain tumors, such as headache and nausea, are the result of increased intracranial pressure caused by the bulk of the tumor or a backup of the cerebrospinal fluid that surrounds the brain and spinal cord. Other symptoms are associated with the “mass effect” of the tumor, or the pressure the tumor exerts directly on the surrounding brain tissue. These symptoms can vary depending on the location of the tumor. Imaging studies are the key component in the diagnosis of cerebellar astrocytomas. A contrast agent is administered intravenously so neurosurgeons can visualize the tumor against the normal brain in the background. • Magnetic resonance imaging (MRI) scans are important to help determine the relationship of the tumor to the adjacent structures. • Computed tomography (CT) scans also are used. 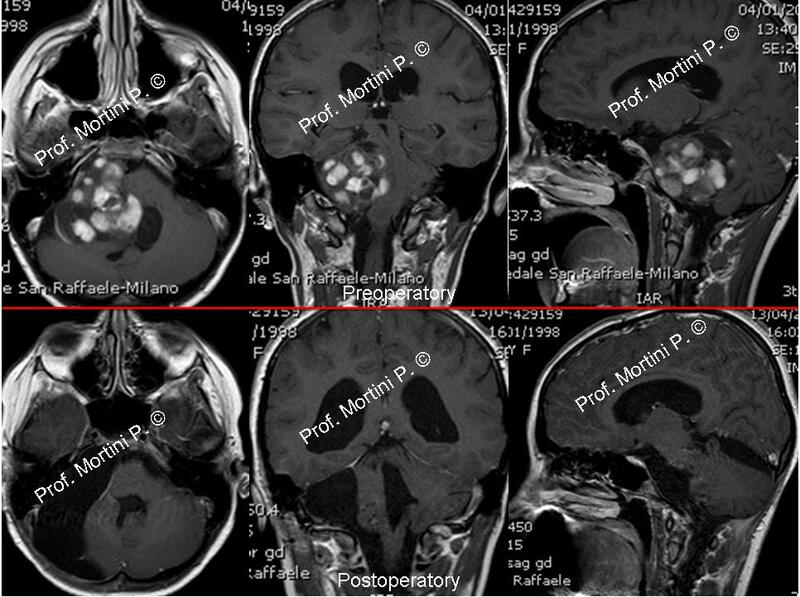 • In some cases, neurosurgeons may employ an MRI scan with frameless stereotactic guidance. For this study, a contrast MRI is performed after special markers (called fiducials) are placed on a child’s scalp. The fiducials are processed by a computer, which calculates the location of the tumor and creates a three-dimensional reconstruction. This image then is used at the time of surgery to help locate the tumor precisely, maximize tumor removal, and minimize injury to the surrounding brain. Radiation therapy is used in cases of malignant tumors, and in children in whom there was an incomplete tumor removal. Chemotherapy is reserved only for serious malignant cases in which complete surgical removal is not likely. In addition, some smaller tumors may be treated effectively with stereotactic radiosurgery, which involves the use of a highly focused beam of radiation to target the cancer cells specifically and leave the surrounding brain unaffected. Not all of the cells in a low-grade astrocytoma are the same, so some of these low-grade tumors eventually evolve into higher-grade ones. This evolution to more malignant forms is the most common cause of death in children with low-grade astrocytomas.